I saw this image today with this caption: "Shaving your legs. Showing up to work on time. Getting baby to sleepâ€”and silently tip-toeing out of the room without waking her up. ðŸ’¤ YOU ARE A WONDER WORKER MAMA. Celebrate those victories." What I didn't expect is that the weeks following, I'd be experiencing a real roller coaster. Combine that with moving, a busy husband, and an abnormally cranky baby, it's been rough. After some research, I learned there are a ton of hormonal changes once you quit breastfeeding and the effects can produce mood swings, depression, anxiety, and of course the feeling of disconnection from your baby. I don't mean to overdramatize because I don't feel like I suddenly have no love for my daughter, but there is certainly this feeling that we aren't on the same page as we were. So today when I saw that image, with that caption, I just sat at my desk and took a deep breath because moms, we really do need to celebrate the small victories. It's been a long few weeks for me. I've been trying to set up a new home, getting used to a new neighborhood, dealing with the struggles of being a full-time working mom, worrying about finances, taking care of a baby who can't communicate why she's cranky, and overall just feeling like a big emotional lunatic of a failure. Motherhood is straight crazy. It is truly indescribable because there are just so many emotions, lessons, ups, downs and daily changes that it feels impossible to sum up how I feel about it. Especially because my experiences change every minute. But one thing I do know is that motherhood has forced me to slow down and be present. 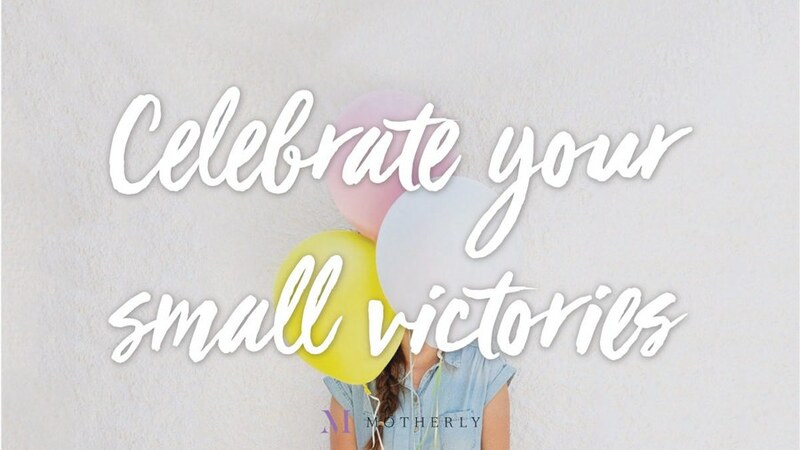 And yes, to celebrate the small victories because they matter. Being a mom is the most difficult, but most beautiful work I will ever do. So when my daughter laughs, or when she almost crawls, or when I am able to get the house clean, or successfully take a nap (Hey, we need them. Right Corinne? ), I will celebrate all the little victories. Afterall, it's in those small moments that some of the greatest beauty and joy can be found.